Extensions provide added functionality to ALM. 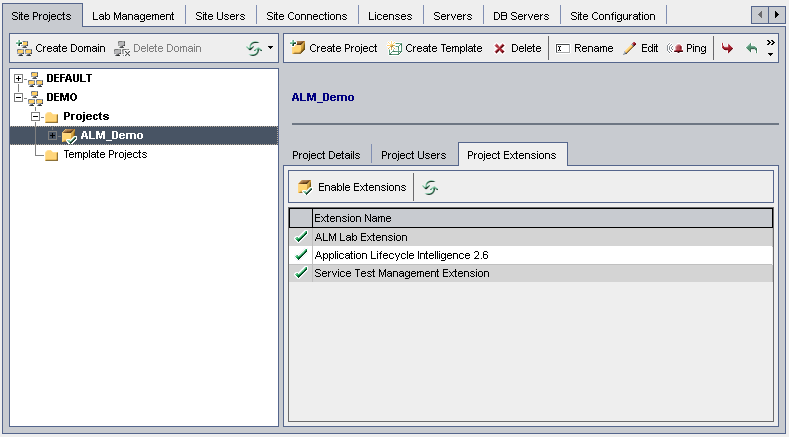 If you have a license for an ALM extension, you can utilize its added functionality after enabling the extension on a per project basis. To view the list of extensions available with ALM, or to download documentation for ALM extensions, visit the Add-ins page, available from Help > Add-ins. Cross Project Customization: If an extension is enabled for a template project, the extension must also be enabled for the template's linked projects. Linked projects can have additional extensions enabled. You can also enable extensions for a project when you create a project. For details, see Creating Projects. In the Projects list, select a project. In the right pane, click the Project Extensions tab. 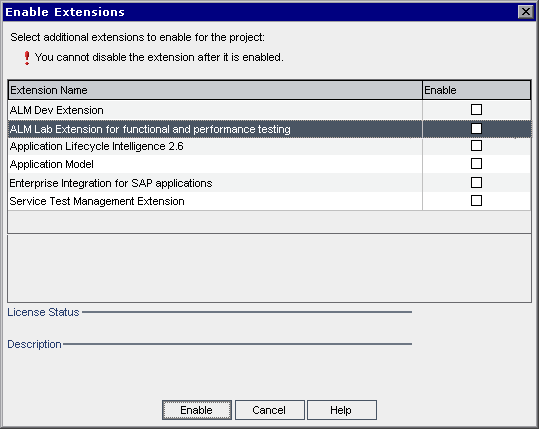 The Extensions list displays the extensions that are enabled for the selected project. To enable one or more extensions for the project, click the Enable Extensions button. The Enable Extensions dialog box opens, displaying the list of extensions available for your ALM edition on the ALM server. Tip: Extensions for which there is no license on the server are displayed in gray. It is possible to enable an extension for which you do not yet have a license. You can utilize the extension's added functionality later, after receiving the license. Select the Enable check box for the extensions you want to enable. Note: You cannot disable an extension for a project after you enable it. We recommend enabling only the extensions you need. Enabling extra extensions can affect performance and consumes additional disk space. As you navigate from one extension to another, relevant license status information is displayed in the License Status section. Click Enable. The selected extensions are enabled for the project, and the extension names are displayed in the Extensions list. To refresh the Extensions list, click the Refresh button .